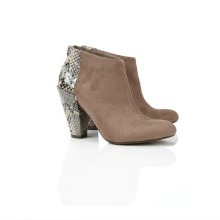 Snake skin animal print shoes continue to be a major trend this season! The key feature of this boot is the snake back which makes it a real eye catcher. The neutral tones make it easy to match with most colours. Heel height is 10cm. 100% Fabric. Wipe clean.